In Verona, the Montagues and Capulets are in the throes of a long-running family feud. In the midst of this, two young members of the families - Romeo Montague and Juliet Capulet - fall in love a the Capulet Ball...but Romeo's family hates Juliet's family, and Juliet's family hates Romeo's family. Regardless, they marry in secret and trigger a chain of events which ends badly for everyone. Tragic! Lianne's favourite colour is probably green. She comes from Peterborough (but often tells people she comes from Cambridge because no-one seems to know anything about Peterborough and it makes her appear more posh). Before training at RADA, she landed her first filmed role dressed as a carrot walking a donkey named George round a field for six hours (her and George still meet up regularly for coffee). 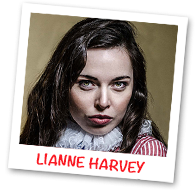 Since graduating a year ago, Lianne has appeared in A NAUGHTY NIGHT OF NOEL COWARD (The Old Red Lion), ENVELOPED IN VELVET (Arts Theatre), BANKSTERS (The White Bear Theatre), BARDO AND GALORE (Sheffield Crucible), NOT SAFE FOR WORK (Channel 4) and CLICKBAIT (Solent TV). She is really excited about her new adventure as a HandleBard, and can't wait to get pedalling! 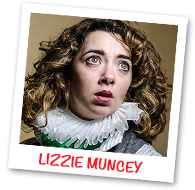 Lizzie is an actress and playwright. She trained at the Birmingham School of Acting. Previous work includes I AM BEAST (Pleasance Theatre, Edinburgh), SUPERHERO SNAIL BOY (National Tour), BEAUTY AND THE BEAST (National Theatre), TWELFTH NIGHT (National Theatre), A MIDSUMMER NIGHT'S DREAM (Skewbald Theatre), and THE HOUSE OF YES (Old Joint Stock Theatre). She is also a highly acclaimed dancer, having performed mainly in her lounge and kitchen. 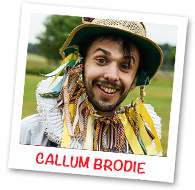 Callum has performed and produced with the HandleBards since their formation in 2013, touring the UK, The Netherlands, Belgium, India, Zimbabwe, Malaysia, Myanmar and Singapore. He trained at Circomedia, the centre for contemporary circus and physical theatre, and previously performed and devised work throughout the UK before falling in love with the HandleBards exuberant style and staying with them ever since. 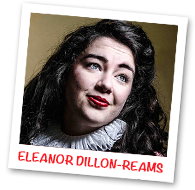 Previous credits include: THEATRE UNCUT (Young Vic, London), CARNESKYS TAROT DROME (Old Vic Tunnels, London), PRINCESS TAZ AND THE FEARSOME FOREST (Etcetera Theatre, London), SEEING DOUBLE (Edinburgh Fringe) and MAKE BELIEVE FESTIVAL (Gorilla Zoo). Since 2013, the HandleBards have clocked-up over 5,000 miles by cycling around the world to perform Shakespeare. Described by none other than Sir Ian McKellen as 'uproariously funny', they set the world on wheels with their unique brand of extremely energetic, charmingly chaotic, environmentally-friendly cycle-powered theatre. They have just been short-listed for The Stage Award 2017. This will be The Handlebards third visit to Malaysia - A Midsummer Night's Dream, followed by Much Ado About Nothing and now - Romeo & Juliet!